Nokia E72 – Optical Navi Key success! For what it’s worth, here are a few notes and ramblings about my experience with Nokia’s new flagship business phone, the Nokia E72. I’ve been looking for a new mobile phone for some time now. Something to replace my constant companion of the last two years, the Nokia E51. It was always going to take something special to trump that phone for me. You might not even have heard of the E51. It came with little of the fanfare accompanying the more high-profile devices of the last few years. 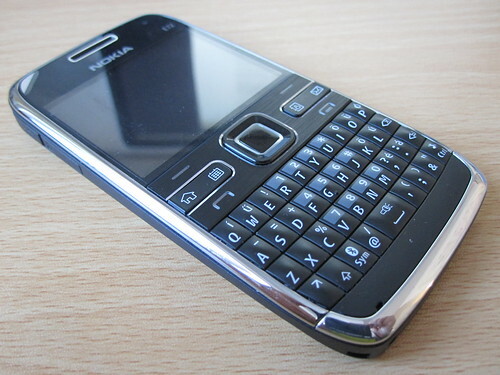 Even within the “business-sector” Nokia E-Series, the likes of the qwerty form factor brethren E63 and E71 stole the thunder from the traditional styled candy-bar E51. And those in turn hardly shouted their arrival like their “cool” cousins from the multimedia N-Series stable. And that’d before we even consider heavily marketed iPhone and slurry of touch-screen devices that followed. 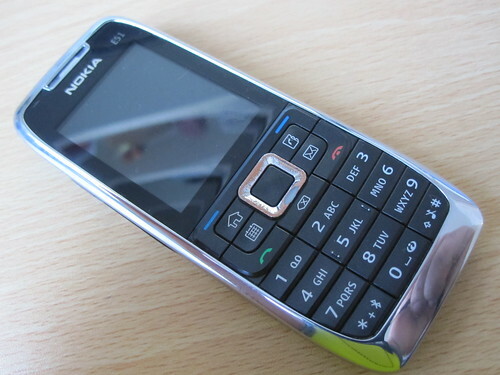 My E51 was in constant use from February 2007 until my latest purchase, the Nokia E72 which I managed to buy from Expansys for a rather reasonable £330. What follows is my reasoning for purchase as well as a comparison with some other phones I had a play (Nokia E61i, E71, E55, iPhone) with before taking the plunge away from my trusty E51. The E51 was nice and small. Small enough to fit into any pocket. 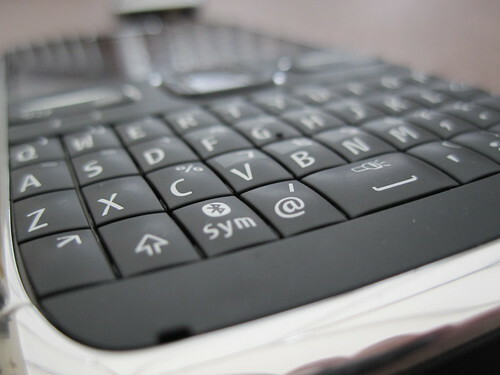 The E72 is a touch wider to accommodate the QWERTY keyboard. There’s not a lot in it though. Whilst the E61i feels really wide the E72 feels nicely in proportion. It’s similar in dimensions to the iPhone but feels a lot smaller. It’s also pretty much the same size as the E71 which I’m not really going to touch on any more as plenty of other reviews have already covered the similarities and differences between the two devices. Despite the small size of the phone it manages to cram a qwerty keypad of four rows, 10 buttons wide. On first glance you’d be forgiven for wondering how you’d manage to type on such a thing but this fear immediately subsides when you start to compose your first message. The buttons are shaped in such a way that prevents miss-typing. They have a comfortable rubbery but sturdy feel to them and I’m already far quicker at typing on the device than I ever was on the E51. Incidentally the E51 had a pretty poor ability to remember words you saved into the T9 dictionary. Must have had a very small capacity for “own-words”. 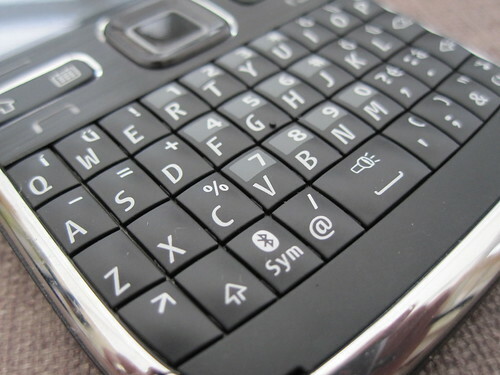 Obviously the E72 has no need for a T9 – one of the benefits of the qwerty keypad. You can see that the E61i has a reasonable breathing space between each key whilst the E72 has hardly any. However I do find it easier to type on the newer E72. The keys are bevelled in such a way that it makes for precise key strokes. The E61i by comparison was to wide in the palm of the hand to make typing comfortable. The E75 has two keyboards. But neither seem up to the task of a comfortable typing experience. 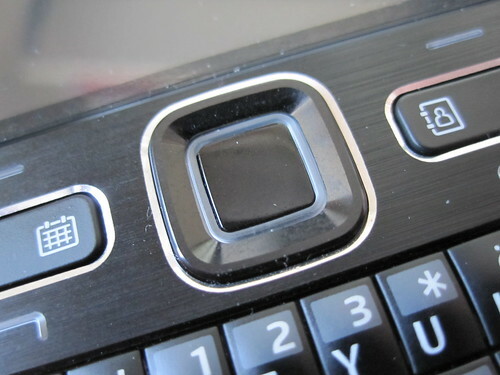 The numeric keypad on the front contains tiny little buttons that are easily mis-keyed and the slide-out keypad is just too wide and the top row of buttons are uncomfortable to use due to the ledge created by the front panel. The particular phone feels like it’s trying too hard to please too many people. Reminds me of the Homer Simpson car. 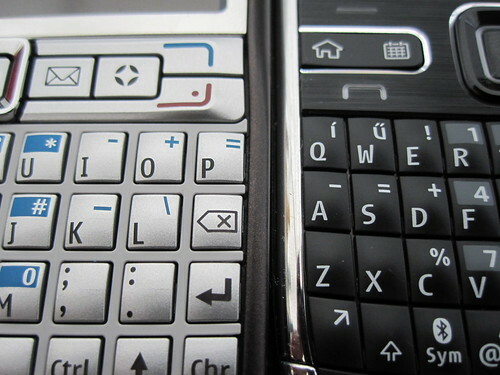 The E72 is considerably narrower than the E61i which makes for a much more ergonomic fit in the palm of the hand. 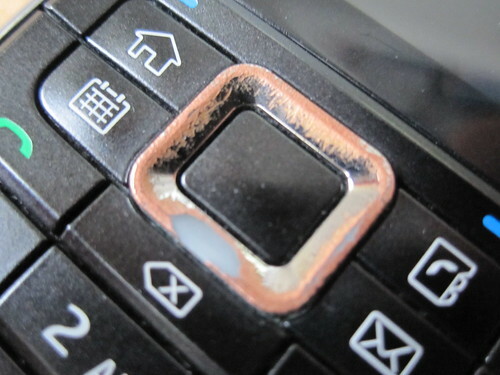 There have been a few complaints in other reviews and on the Nokia forums about light leaking from between the buttons on the phone. Whilst there certainly is “light-leak” it’s not something that I immediately noticed nor something that particularly bothers me. I’m fairly sure most of the phones I’ve ever owned have been unable to keep the lighting from escaping from behind the keys. 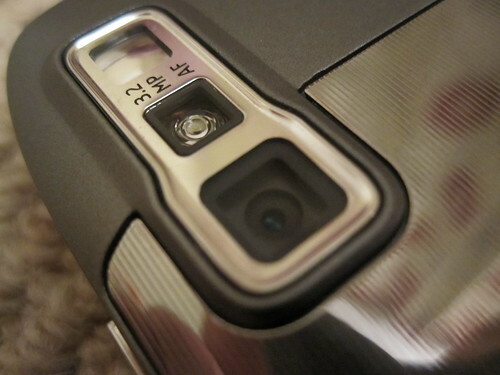 My old Sony Ericsson K750i was a particular offender and that particular unit did bother me but the E72 is bearable. Talking about lighting, the E72 has a torch! 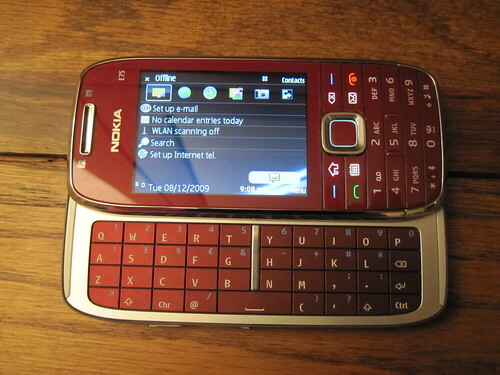 That was something I really liked with my Sony Ericsson K750i and W800i. The LED that is usually used for lighting photos can be turned on by holding down the space-bar for a few seconds. I use it frequently when my young son is crying for his dummy in the middle of the night! The one-touch keys are just as ergonomically polished as the keypad. 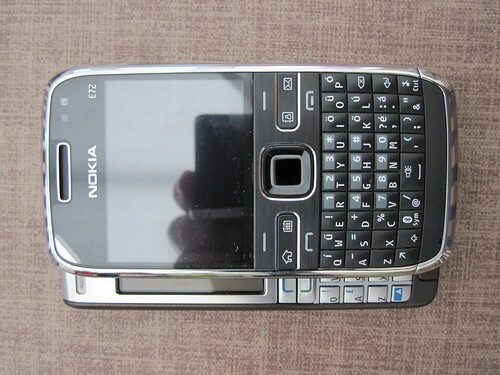 One failing of the E51 and the E71 was the arrangement of the home, calendar, contacts and message key. They were very crammed together. Not so on the E72. There’s plenty of space between the buttons and this spacing along with the attention to detail on shape of the buttons make them really easy to use. The call start and end buttons, whilst not green and red, do carry the usual symbols and I cant say I missed the lack of colour in this respect. The directional pad, which pulses when the phone is on stand-by, has a nice action and is unlikely to suffer the same fate as the directional keys on my E51. The directional pad also doubles up as an optical navi-key which to a while to get to grips with but I had a moment of clarity and now wouldn’t turn it off. You run your thumb over the middle part of the directional pad in the direction you’d like to scroll, much like a touch screen. I do see the advantage of using it for browsing web pages but for some actions I prefer the accuracy of the directional pad in much the same way as I prefer the digital pad to the analogue controls on the Playstation joypad. I’m glad Nokia made this an optional feature as it’s a bit of a controversial change for those used to the old way of doing things. I opted for the Zodium black flavour. It’s also available in Silver and Gold. However, the optical factor means the centre button must be black rather than a silver or gold colour which would have suited the respective colour scheme much better. Regardless of this factor I would have gone for the black version as it looks really sturdy and the other two look a bit plasticky. I’m sure they’re not though and are built of the same rock-solid metal materials. The E55 on the other hand feels cheap and compromised and more than a little like an N-SERIES phone. It feels like a design-by-committee phone. 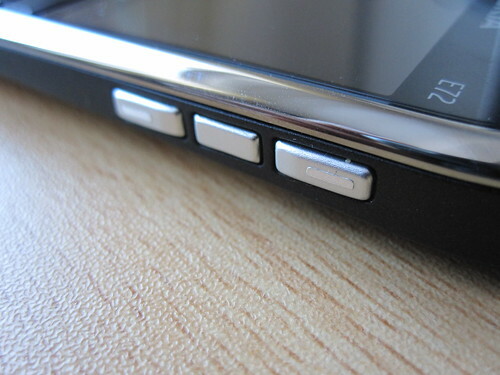 There’s very little plastic on the external surfaces of the E72. The metallic construction makes it feel like it could outlast the E55 and definitely the E51 who’s volume buttons have now completely crumbled away! 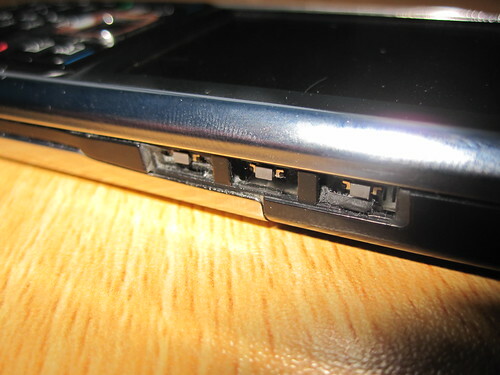 There have been concerns about the loose fitting of the back-panel of the E72. Having read a few reviews before purchase I was eager to see if this was the case with my E72. I put the battery into the phone and then the rather thing but solid backplate. Sure enough it seemed a bit loose at the bottom right edge. I chose to ignore the fact and set the thing charging up. Weirdly, having charged the phone the back-plate was no longer loose. Was it all psychological, did the battery expand or is it just a very subtle issue? To me it isn’t an issue and the phone feels sturdy in my grip. The screen resolution has also come in for some criticism but it looks crisp and clear to me. If more pixels means less battery life then I’ll take the lower resolution thanks. The S60 operating system remains confusing and unintuitive. The E75 and E72 both put the settings in a new folder called “control panel”. But you wont find all the settings there. So working out how to get things working to your liking requires the usual S60 brain-ache. Contacts, Calendar, Texting and Audio player are as expected from s60: functional but mildly irritating in execution. 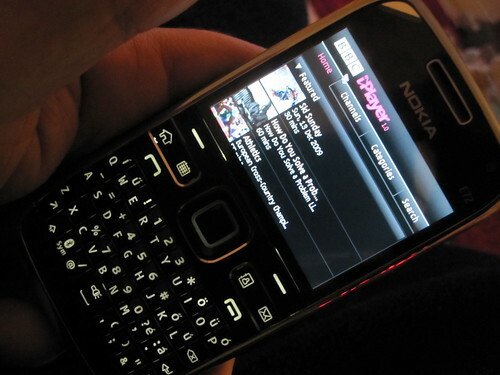 Whilst Nokia make amazing hardware, the user-experience could use a serious overhaul. But it’s not a significant enough issue to push me toward the iPhone or Android offerings just yet. The main issues I noted were that Switch (to migrate from one Nokia to another) didnt work. Exchange server is hard impossible to setup. Gizmo (whatever that is) is invasive — prompting you to set it up whenever you do a WLAN scan. Good points: the chat client for use with Google Talk, Microsoft Messenger and the like works exceptionally well. As does the Nokia email client. Had Gmail up and running in a sudo-push email manner in a matter of minutes. The bundled YouTube client is fantastic and well geared to the device. Maps and GPS is work better when using Google Maps as opposed to the Nokia Maps client (which has trouble locking on to satellites oddly). Syncing with Google Calendar is impossible and rather irritating but I’ll live with it. The help files supplied on the phone are very basic and dont cover even a tenth of what the phone can do. It’s fairly using the search facility with the help as it can only match exact terms. So you need to know what things are called to find a result. Installing new software applications ought to be easy and it is as long as you can deal with the certificate issues. Basically the phone will prevent you installing anything out of the box and you need to change the certificate settings. You’ll have to hunt to find out where those particular settings are located. The camera isn’t bad. An upgrade from the 3.2MP unit in the E75. I cant see that 5MP is really a general improvement but it is perhaps a cheaper option for Nokia than improving the software so the camera is a bit more speedy at taking snaps. It takes photos of inanimate, stationary objects no problem but don’t expect it to be fast enough to get a halfway decent shot of the kids! There’s also a video camera on the front for video calls. Not something I ever do so cant really comment about that. I’m sure that people who like to see who they’re talking to will appreciate the feature. The gallery is reasonable enough. It’s like the one you find on N-SERIES devices with a picture carousel spinning through most recent to oldest photos. The video gallery is a huge improvement on my old E51. On that I didn’t even get a still from the clip to determine if I was about to load the right video or not so I was pleasantly surprised by the E72. The standard headphone jack is a welcome addition. I never bothered with the headphones provided with the E51. 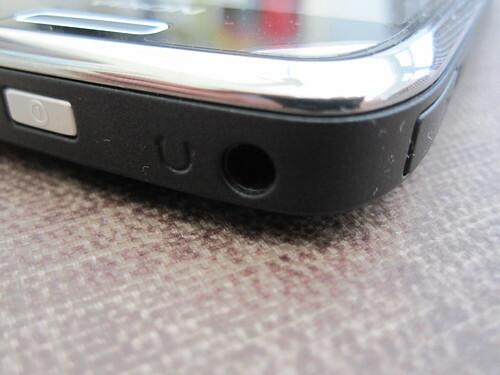 The E72’s standard size headphone slot means I don’t have to. Spotify and iPlayer work perfectly and I hook the phone up to various docks around the house and in my car now. Battery life is amazing and USB charging is a definite bonus. I get around five days between charges with moderate usage. This is way better than my E51. I’d be interested to see how the battery performs in two years time. Fortunately spares are relatively inexpensive. One peculiarity with the package was that the manual was in Finnish! But I did get a PDF printout of an English version included. A bit shoddy on Nokia’s part but no big deal. The provided carry case is very useful but I bought a silicon skin so I could stick it on various surfaces around the house and have the buttons at easy lens. 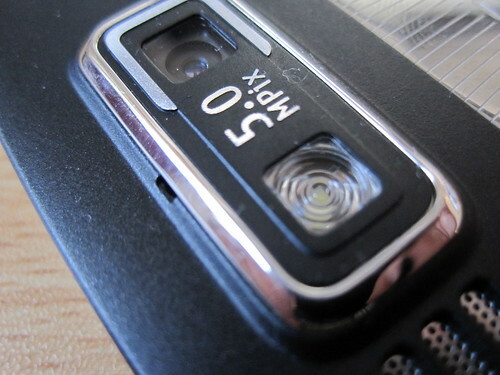 The Silicone skin also protects the protruding camera lens somewhat. The leather case that comes with the phone is great at protecting the screens and keys though. It took me a while to discover how to manually activate the key lock. It’s completely different to the standard numeric keypad method. But onc you know it’s easy to remember: the left select button followed by the right select button under the screen. 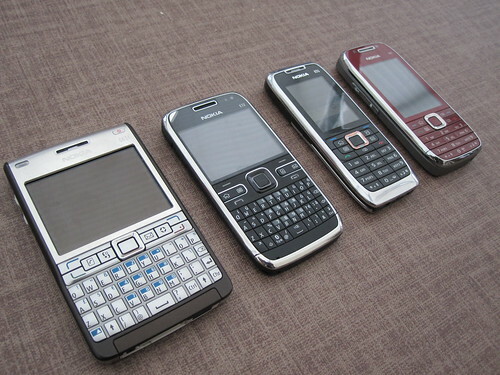 In conclusion, the E72 will definitely last me at least the next couple of years. The build quality is fantastic. Ergonomics are about as good as you’ll get in a device this small with a full qwerty keyboard. The battery life is second to none and the wealth of supported mainstream apps make is a decent competitor to the iphone and android clan. S60 continues to be the achilles heel and if you’re after amazing software usability you’ll be disappointed. I’ve been using Nokias and S60 a few years now so am used to the foibles but I’d be keen to see how people used to more user friendly devices would cope. The optical nav-key was the biggest surprise for me. I didn’t expect to get on with it at all. But I love it!